First I want to talk about baseline tolerance. You know how some people have to put on more cologne each day just so they can smell it, while the rest of us gag? That is baseline tolerance. * Vin Diesel ("The Pacifier") is Riddick, the legendary loner who sets his own broken leg (don't ask). * Jordi Mollà ("Knight and Day") is Santana, the bounty hunter. 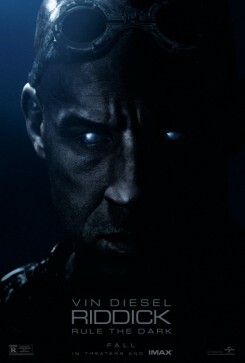 To him, Riddick is worth more dead than alive. * Matt Nable ("Killer Elite") is Boss Johns, seeking Riddick to learn more about his son's death. The story? Left for dead on a sun-baked planet, our hero fights against all odds and plots revenge. That pretty much covers it. This has some of the best CGI work I have seen to date, the production design is wonderful, the photography is masterful, the story is basic but involving, and like other Diesel outings, includes an anti-drug bit. On the other hand, the R-rated plot is rudimentary, the comedy is crude, the fight scenes are endless, and one of the monsters eats its own entrails. Fan boys loved the action, while I admired the CGI. Yup, I said it!